Chasing rarities is risky, if you don't see the bird(s) you were seeking, then there might not be much else around to see. So it was with this weekend, not a total bust but disappointing. I did add a few more year birds for my efforts. This is a common Eurasian duck that shows up on these shores every couple of years. 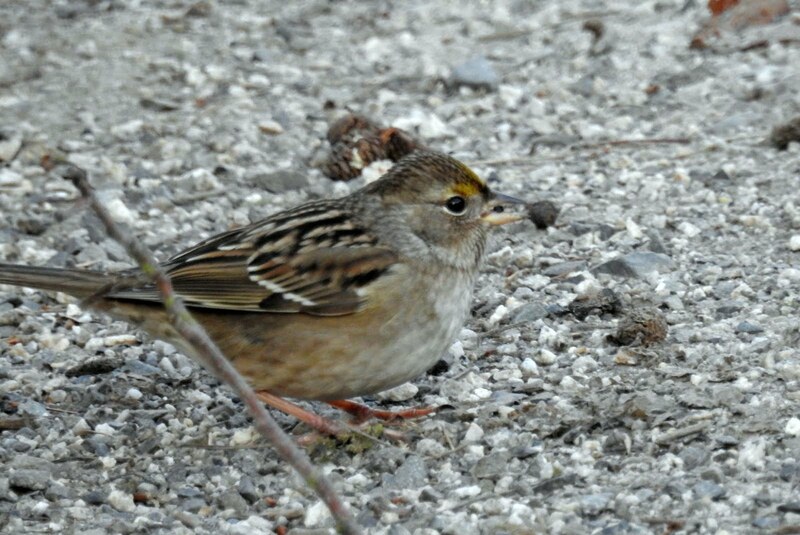 My first one was in 2008 at Reifel, and I'd seen one at Iona in 2014 and 2015. There had been reports of one in the settling ponds at Iona for the last week. It was a cold weekend and two of the four ponds were completely frozen. 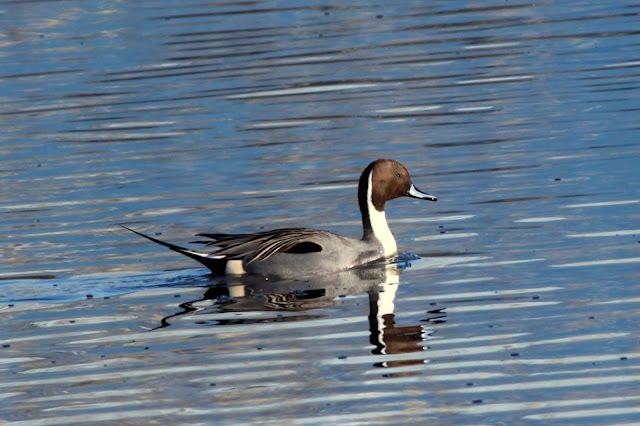 There were a few hundred ducks on the north-east pond and I started scoping for the Tufted. I found one likely suspect and took some photos and digi-scoped a movie, but I concluded it was a Lesser Scaup. 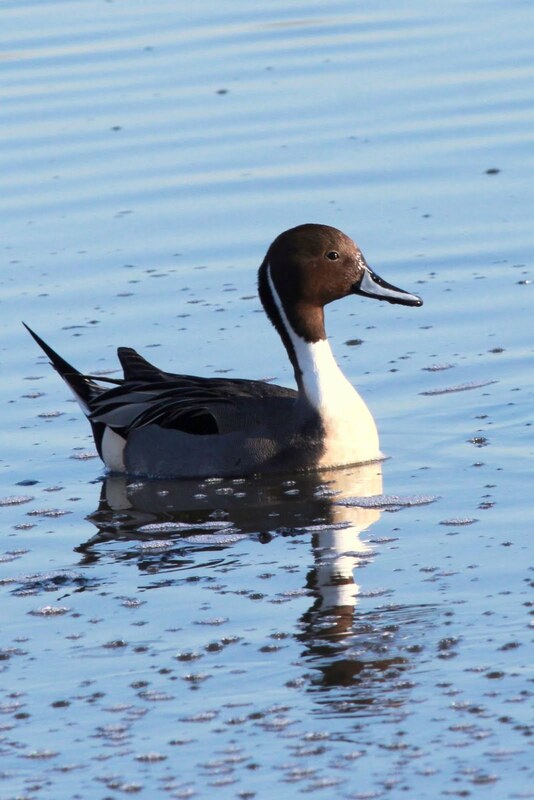 Both Scaup species are similar to the Tufted. I did pick up a couple of year birds for my trouble. 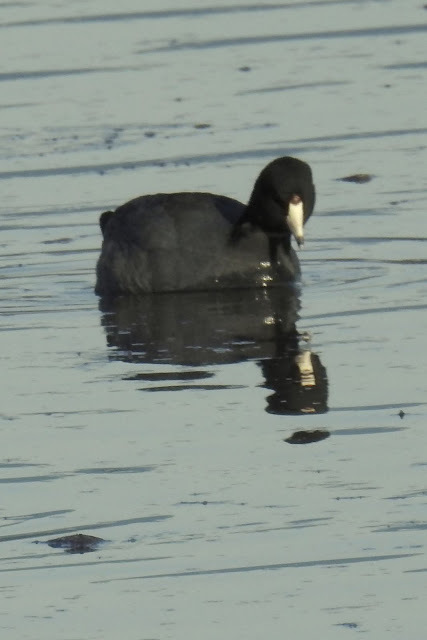 This was my first sighting for American Coot as well. Here's the Lesser Scaup I mentioned. This was at quite a distance. 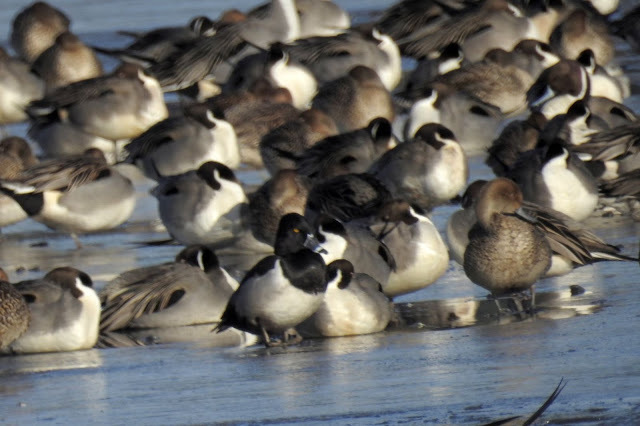 The Scaup is missing the tuft at the back of the head and has a white/gray back. 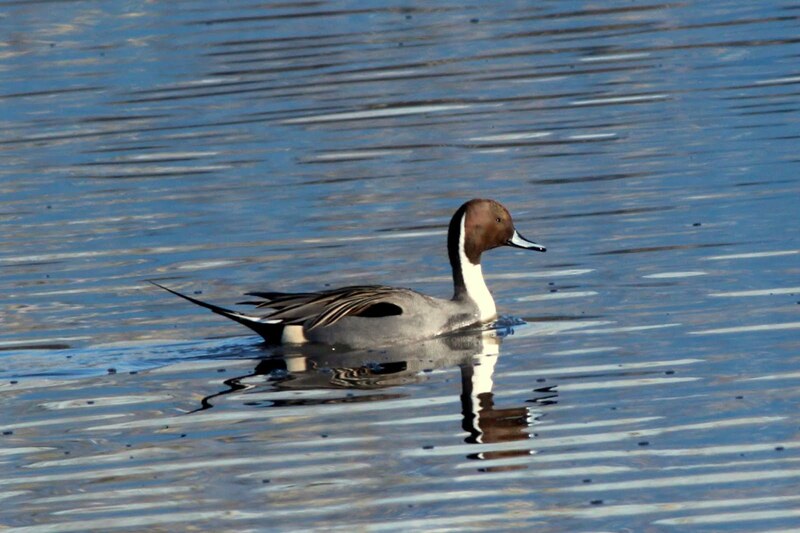 The Tufted has a dark back. On Sunday, I decided to try heading east. There had been a Green Heron reported at Brydon Lagoon in Langley, and the overwintering Prairie Falcon was still being seen in Pitt Meadows. Brydon Lagoon is part of a Langley city park. It's about 250 metres long and 100 metres wide. There's a trail that circumnavigates the lagoon and there are other trails as well. 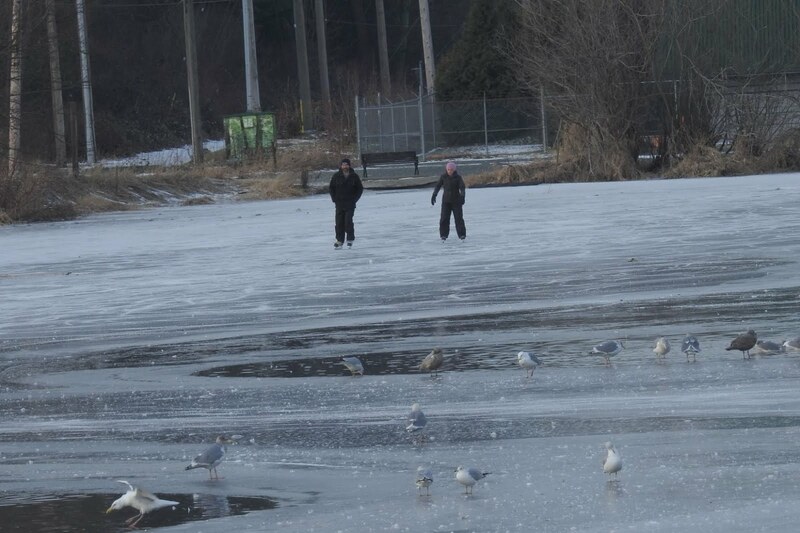 Upon arrival, the first thing I saw on the Lagoon were a pair of ice skaters and a few Gulls. I looked for the Heron in the reported location, but there was no sign of it. I did see a few birds along the paths. 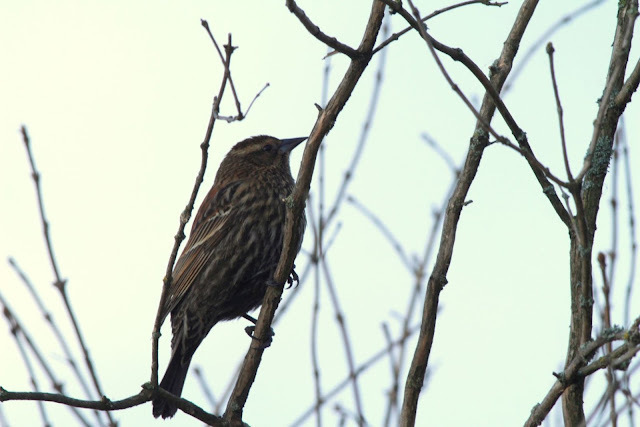 The Red-winged Blackbirds are common here, I saw only females and immature ones. 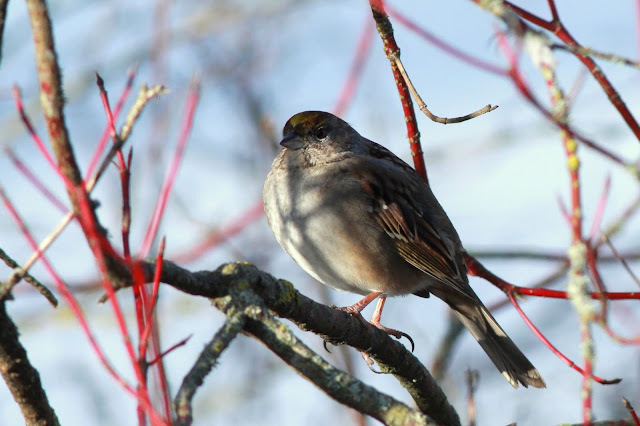 The Golden-crowned Sparrow is a familiar sight in the winter and I saw a couple of them. 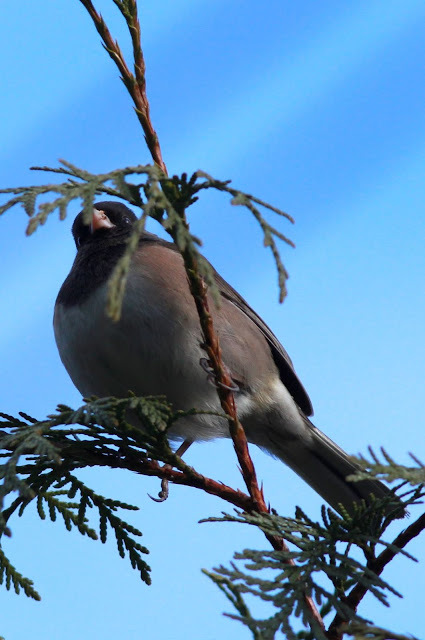 My only other sighting was a Junco. Although I have them in my backyard all winter, this was my first photo. My next stop was Pitt Meadows, which is a quick drive from Langley as long as you're willing to pay the toll on the Golden Ears Bridge. I drove around the area where the Prairie Falcon is normally seen but saw no sign if it. Since my trip out there, a Gyrfalcon has also taken up residence in the area. Both birds will head North sometime in early spring. 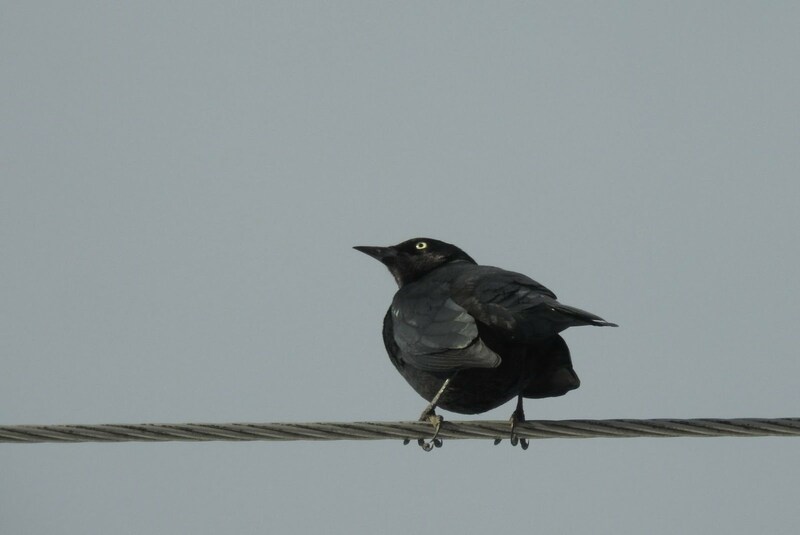 My one sighting was a Brewer's Blackbird in with a bunch of Starlings. Although much more common in the Okanagan, these blackbirds do like the rural areas in Langley and Pitt Meadows. This wrapped up my "lost" weekend - I'd have better luck on the following weekend.